The 7′ x 7′ Windsor Primrose Playhouse with Dorma Window is one of the most impressive and charming child’s playhouses to ever be created. 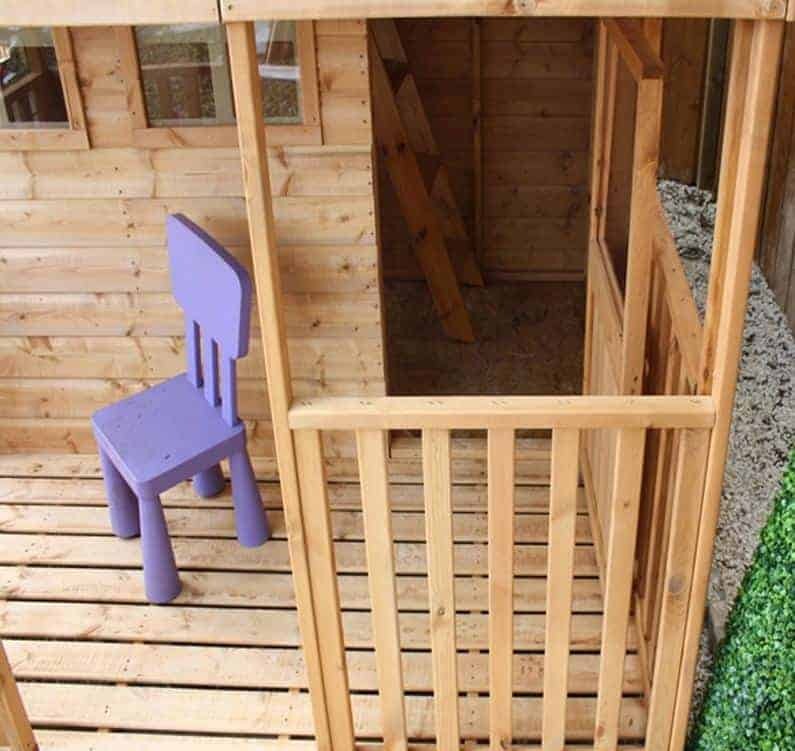 Offering a lot of space to play with and organise down stairs, the playhouse offers even more room by having an upstairs which can be reached by a child safe ladder. This adds even more room for them to enjoy and looks amazing in the process. 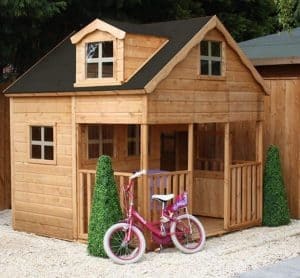 This is a playhouse which just has so many great and standout features such as that lovely Dorma window, a gorgeous little picket fence and a whole host of other windows so that they can sit and watch the world go by. 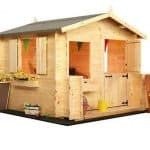 This is one wonderful playhouse that is going to offer your children or grandchildren many years of enjoyment. 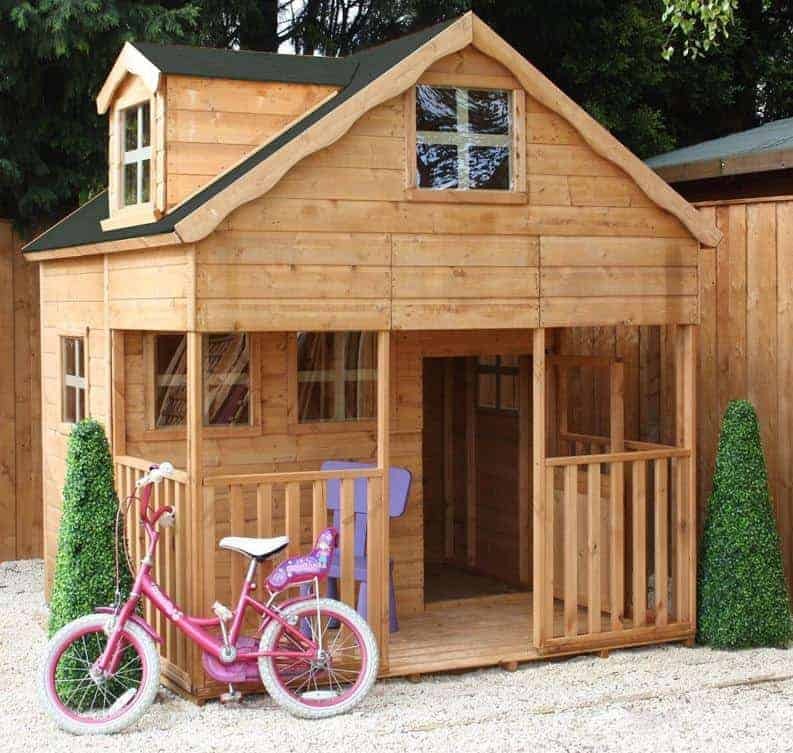 This is clearly a wonderful looking playhouse, but to make certain that it will be in your garden for lots of years, Windsor have used high quality shiplap cladding and an apex roof to protect against bad weather. Strong roof and floor boards have been used to make it so this is just an incredibly strong and safe place for your children to play and create a whole lot of fantastic childhood memories which they will be able to share with their own children many years down the road. To say that the 7′ x 7′ Windsor Primrose Playhouse with Dorma Window looks incredible is just a huge understatement. We feel that it would be near impossible to see this playhouse for the first time and not be 100 percent impressed. This two story playhouse has been designed so that it resembles a real house and not so that it looks like a child’s playhouse. Kids will absolutely love this and the amount of space they have inside over the two floors is just incredible. From floor to the very top of the playhouse the height is 7 feet 10 inches. The depth is an amazing, 6 feet 11 inches with the width being 6 feet 10 inches. The space inside here is just amazing, allowing the children to really design their own little dream home. The playhouse has a fantastic little veranda which can be used for the kids to sit out on and enjoy a nice summers day, a place to store bikes, toys or for whatever else their imagination can come up with. This veranda also has an adorable picket fence which really just puts the cuteness factor of the playhouse over the edge. The roof of the playhouse is every bit as gorgeous as the rest of it is. Windsor have used an apex style roof here to help give it that real house kind of look. There is a Dorma style window on the roof as well which itself has an apex style roof. The roof is made with solid sheet boarding which is 8 mm thick and then protected with some high quality roofing felt to offer protection when the rain is pelting down. We were very impressed with the 12 mm thick horizontal shiplap cladding which has been used here. Even from a distance it looks fantastic and once you get up close and touch it you can feel right away just how high quality it is. The cladding has been made with very high quality wood to ensure that it will last for many years and the shiplap design is just perfect when it comes to keeping out the rain, snow and anything else our British weather wants to throw at it. As this is something that is made for kids to have a lot of fun with we took a very close look at the frame because it is the frame which will dictate just how long this playhouse will be standing strong. Well the frame we are happy to report is very durable and made with top of the line wood to make certain the playhouse will be able to be enjoyed for a lot of years and never get flimsy or weak. 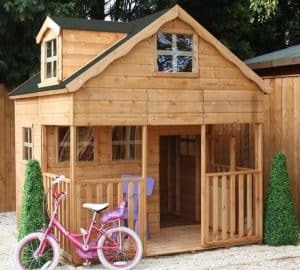 In keeping with the high quality theme that is running all the way through this playhouse, Windsor have made sure that the floor is able to take the weight of a whole lot of toys, kids dancing, running around or whatever else they may get up to inside here. 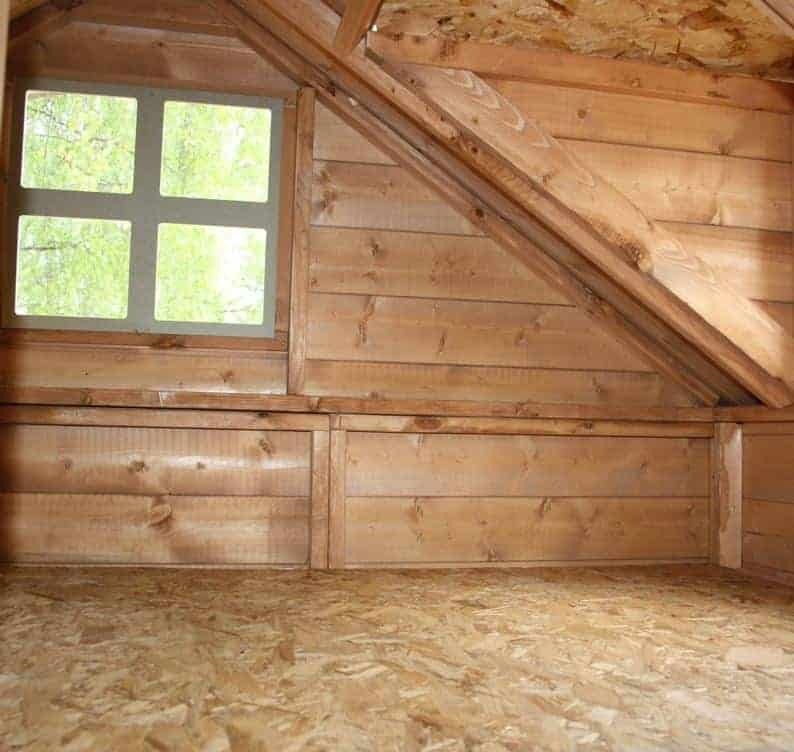 The floor is made with the same style of solid sheet boards which are used for the roof. However these boards are a little bit thicker at 10 mm. This along with the rock solid floor joists will make the floor be able to take a lot of weight and will give it a good and sturdy feel. 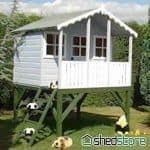 As with any wooden type of shed or playhouse you are going to want to give it a coating of wood treatment once it is built. We always suggest that you do this as soon as it is built and then give it a fresh coat once per year. This will help the wood stay strong, but also keep the playhouse looking great. 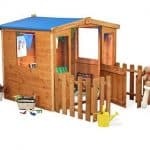 There is a one year warranty which covers you against the actual parts of the playhouse so if something goes wrong with the picket fence, for example, then Windsor will fix or replace it. 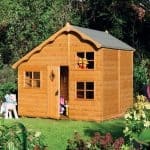 You also though get a ten year anti rot guarantee which we think is great, but to validate this, you must make sure you coat the playhouse in wood treatment. The 7′ x 7′ Windsor Primrose Playhouse with Dorma Window may only have a single door, but we really love it. It is kind of hidden behind the picket fence and it just looks so cute and welcoming. The door also has a good height of 3 feet 6 inches and a width of 2 feet to make it easy for your kids to get their toys, furniture or other items in and out of the playhouse and let us tell you they will want to bring a whole lot of stuff inside here! The door is kept in place with some very good door hinges and it even has a styrene window so that they can peek out and see who is knocking on their door. Including the one on the door there are seven windows on this playhouse. This lets in a great amount of light and adds to the real house look and feel of it. On the bottom floor there are three windows on the front, this includes the one that is on the door. There is also a window on each side of the house. On the upper floor there is Dorma window which is actually one of the first things that you notice about the playhouse and another window right on the front. These windows are made with styrene which is very safe for kids as it cannot smash. 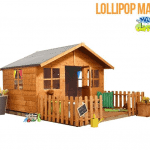 This is a solid and strong playhouse which does add a lot of security. The door does not have a lock, but we always think a lock on a child’s playhouse is a bad idea and will stop the children being able to just walk in and out as they like. The door though when shut does so very securely so there is no worry about it blowing open in the wind. Privacy with a playhouse like this is really not something you are ever going to get. It has windows all over it so that you can see inside and so the kids can see out. We personally love this as it is a lot of fun to be able to have a peek and see how the kids are enjoying themselves. Of course if your kids get sick of this then some curtains on those bottom windows can give them some privacy. One way that you can customise the playhouse and even get the kids involved is by letting them pick the colour of the wood treatment. This will protect the playhouse and also let them have fun getting to feel like a designer by picking the colour. The only extra that Windsor offer you to buy for the playhouse is some extra flooring support which if you are going to be building this on grass you might want to consider, but to be honest we think the playhouse would be fine as it is. 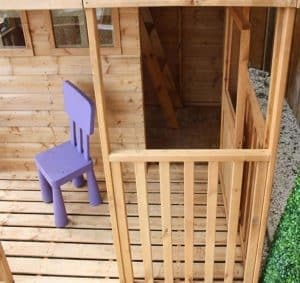 This playhouse has been crafted with just the highest quality of materials and we honestly could not be any more impressed with it. This has certainly been designed to last a long time and even with the abuse that kids will give it we are sure it will be there for them to use for many years. This offers two floors for them to make use of and both of them are a good size. You also have the veranda which they can make use of. In all they will be able to fit a whole lot of things inside here. Which, if you have toys cluttering up your house, is an added bonus. This is a great looking and large playhouse, but it is going to be a challenge to build and certainly require at least two people. The instructions will get you through it, but this is going to take you quite a few hours. Just be sure to have plenty of snack breaks and you will get through it. 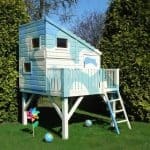 It is just a shade under £700, but with how great it looks and how well made it is we do think this is a playhouse that is worth this kind of money. Final Thoughts: The look on your kids or grandkids face when they see this built for the first time will be worth more than double the price of this playhouse. It is just so charming to look at and it will offer them years of fun. It has been designed with child safety in mind so it offers a safe and large area for the kids to enjoy and call their own. We know that £699 is not a small amount of money, but we do feel that the memories and enjoyment which the 7' x 7' Windsor Primrose Playhouse with Dorma Window creates is well worth it. This would make for a very special gift and one that they will remember forever.